Sony has announced that it is bringing 35mm shooting to its Handycam range. 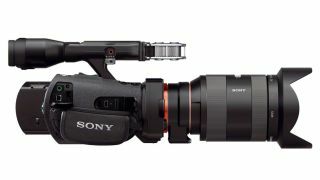 The Sony Handycam NEX-VG900E camcorder offers up 24.3 effective megapixels and has the option of interchangeable lenses. The new cam allows Full HD 50p/25p/24p progressive movie recording, has extensive manual controls and 'seesaw' zoom lever and has been given a 3.0-inch XtraFine touch panel LCD. Given that it produces 35mm content, Sony has seen fit to add a number of film features – including Cinema Tone Gamma and Cinema Tone Colour which offer precise control over cinematic colour grading effects. According to Sony, AVCHD version 2.0 standard 50p recording is additionally supported. As with most of Sony's kit, there are a bunch of extras you can get with the NEX-VG900E. These include: the new E PZ (Power Zoom), 18-200mm F3.5-6.3 OSS (Optical SteadyShot) lens. There's also the release of the Handycam NEX-VG30, which comes with the same APS-C image sensor as its predecessor while adding several enhancements. The camcorders have a release date of November (NEX-VG900E) and December (NEX-VG30) with pricing to be announced.